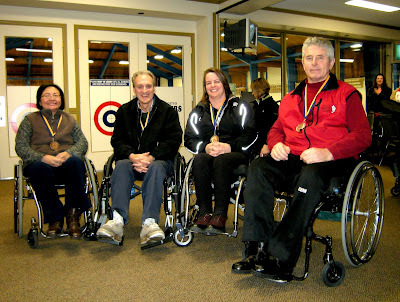 Newfoundland's St. John's CC is hosting an introduction to wheelchair curling on February 14th between 11 am and 5 pm. The club plays at the Remax Centre, a fully wheelchair accessible facility. Paralympic gold medal skip Chris Daw will lead the session, though no word on whether he will be accepting Valentine chocolates or kisses. "This introductory clinic is aimed at anyone in the province who wishes to participate in wheelchair curling and will help build our provincial program," he said. Email Chris Daw at chris@chrisdaw.ca for more information. The Lennoxville CC, a newly formed team keen to get in as much practice as possible before the nationals, drove through a snow storm to take on the two Ottawa teams last Sunday. They beat both Team Cameron and Team Fraser, and the 4th end of the Fraser match ended with all 16 rocks in the rings. Registration for the Ontario Provincials closes January 30th and the Provincial Association had decided that only four teams would be allowed to compete, one from each region. A regional playoff would take place February 7-8 if more than one team from a region applied. The four team Provincials limit is controversial and seen by some Ottawa curlers, who have the potential to field two teams, as being unnecessarily restrictive. Tom Ward of the Ontario Curling Association says that no decision has been made about what would happen if there were more than two entries from a region yet less than five total. "We'll wait to see how many applications there are before deciding," he told me. BC, in organizing their first Provincial Championship this year, initially expected to use a traditional regional structure, but abandoned it in the spirit of maximizing participation in the championship. In the end only Team Austgarden in the four team field was drawn from the same region. The club held a demonstration day last weekend and hopes to attract enough wheelchair users to form their own club team. 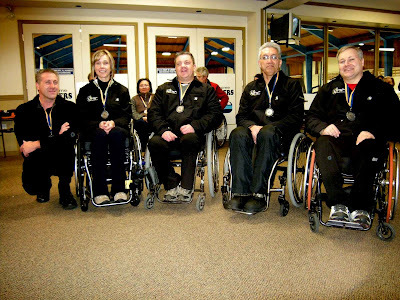 Wheelchair curling in Nova Scotia has been centred in Lower Sackville, host to the 2009 Canadian Championships. 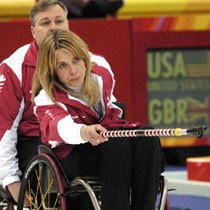 A report on The Curling News blog that Sonja Gaudet had been selected as the alternate on Team BC for the 2009 Canadian Nationals appears premature. Team BC skip Jim Armstrong tells me that a final decision has not been made about who will be the alternate if in fact CurlBC's budget allows for one. Jim Shannon, one of the athletes instrumental in establishing wheelchair curling in BC, has died in Vancouver after a long illness. He is survived by his parents Melvin and Beryl Shannon, his daughter Aubrey and his sister Joyce. He was 62. His daughter said: "Jim was born in Medicine Hat on Sept 26 1946. He grew up in a curling family. He absolutely loved wheelchair curling. He died on January 15 2009. He courageously battled his aliments until the day he died in the hopes of regaining his independence and getting back to the curling rink. He also has been a long time volunteer at Pearson Centre, coordinating the karaoke group there, going on most weekends to involve the residents in his love of karaoke." A memorial Service will be held from 2:00 to 4:00 p.m. on Saturday, February 21st at George Pearson Hospital, 719 West 59th Avenue, Vancouver. On-line condolences may be expressed at www.schoenings.com or a comment left below. Jim skipped BC to consecutive silver medals at the 2005 and 2006 National Championships, and was the alternate on the team that won gold at the 2007 Championship even while he had curtailed his time on the ice because of illness. Team mate Darryl Neighbour credited his start in the sport to Jim. “Jim Shannon inspired me and asked me to come out and try it," he said. Darryl is now playing 3rd for Team Canada. 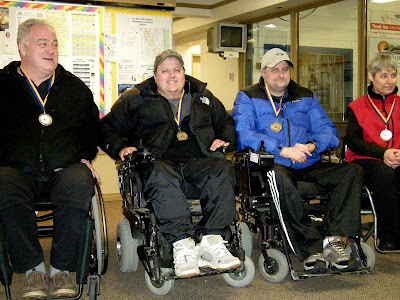 A fixture at events at the Marpole and Richmond CC, Jim was recognised in 2005 with an award for his service in promoting wheelchair curling. A team from Duluth MN beat a team from Thunder Bay 9-2 in the first ever cross border wheelchair curling club challenge match in Grand Marais, MN. The game was remarkable for the fact that the Minnesota players used a rolling rather than a stationary delivery. Duluth team member Shawn Corbin explained his surprise to discover that WCF rules insist that delivery be from a stationary wheelchair, as he had become used to manipulating both rock and chair towards the hogline before release. He felt that his method had considerable advantages, and saw no reason why the rules should not allow for it. I will post our emails on this subject as a comment below. Jim Armstrong will be defending his 2008 Canadian Nationals, though this year his team of Frank LaBounty, Whitney Warren and Jackie Roy will have earned the honour on the ice rather than had it handed to them at camp. In the morning semi-final against Darryl Neighbour, he took 4 in the 1st and ran out a 9-6 win that was never as close as the score suggests. The afternoon final against unbeaten Team Austgarden was a different matter, with play in the four foot almost every end and both teams impressing the spectators with consistent draw weight. Armstrong stole to a 4-0 lead after 3 ends, Austgarden took 1 and then stole 2 in the 5th when Armstrong's attempt at a last rock save came up inches short of the button. It took a measurement to give Armstrong a steal of 2 in the 7th, and in the final end, down 4, Austgarden had 2 rocks counting in the back of the house with skip stones to play before Armstrong threw a takeout through a narrow port for a decisive hit and a 9-6 win. Gerry Austgarden, dropped from Team Canada 2009, had another two easy wins at the BC playdowns in Vernon, defeating Lindstrom 9-3 in the morning and Armstrong 11-1 in the final round robin draw. Armstrong faces Neighbour at 8.30am in the morning semi-final with the winner playing Austgarden at 1.30. Gerry Austgarden beat Darryl Neighbour 9-4 in the first draw of the BC playdowns in Vernon. He went out to an early 4 point lead, Neighbour, with 2 in the 3rd and a steal of 1 in the 4th, pulled to within 1 at the half-way point but gave up a game settling 3 in the 5th. Wheelchair curling is thriving in Northern Ontario with more than two dozen active players at clubs in Thunder Bay, Kenora and Dryden. Three competitive teams are expected for the first ever playdown to choose the 2009 provincial representative February 1-3 at the Fort William CC in Thunder Bay. Long-time Team Canada skip Chris Daw will have recovered from a serious hip injury in time to skip Newfoundland/Labrador team at the 2009 Nationals at the end of March. The team was formed this season with athletes who bring considerable outside competitive experience to the ice. Darlene Jackman and Joanne MacDonald are Paralympians, Lanie Woodfine is an accomplished road racer, and Felix Green has represented the province at multiple sports. The team has an experienced coach in Leslie Ann Walsh, herself a Mixed provincial champion. This weekend will be busy from coast to coast. Team Canada holds a closed training camp in Richmond BC, while on the east coast the Atlantic provinces are holding an open training camp in Lower Sackville, NS, with anyone interested invited to participate. Coaches Helen Radford, Leslie Ann Walsh, and Chris Daw will supervise both a high performance camp and exhibition games, after which team selection for Nova Scotia and Newfoundland/Labrador will be announced. In Manitoba two teams will compete in a playoff to determine the provincial representative. 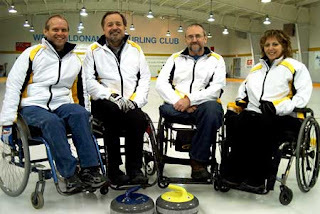 The 2008 Team Manitoba will hope to repeat as champions, skipped this year by 2009 Team Canada member Chris Sobkowicz, with Dennis Thiessen, Michael Alberg, Arlene Ursel, and with Terry Lindell as alternate. Their challengers are George Horning (Skip), Richard Dudek (3rd), Don Kalinski (2nd) and Effie Loubardias (Lead).